The solid Classic Pear and intricate Embellished Pear overlay dies quickly transition between the seasons and become a great combination for holiday cards too. The leaf and stem - part of the Classic Pear set - realistially accent the pear when cut from Dill Cardstock and recycled cardboard. It's outlined and shaded with Pink Sky from the ColorBox Chalk Limited Edition Collection. Diecut a simple "noel" from Cranberry Cardstock using the Classic Lower Alphabet set (yes, it's upside-down here!) - and layer everything over a background of Distressed Jingle Bells stamped in ColorBox Chalk Guacamole Limited Edition Ink. The previous card featuring the Classic Pear Die was so easy I thought I'd share a quick Christmas thank you variation of it. If you have the coversheets from any of the Memory Box 6x6 holiday sets you'll be able to create a bunch of these in just a few miniutes (and congratulate yourself for recycling something from your stash of papers!). The Yuletide set is used for this card. See the great collection of dies and papers here. Just diecut the coversheet, at an angle, and ink the edges of the pear with Pinetree. Cut stem from the narrow strip of the brown print on the right, and cut the leaf from the green starburst print in the set. Ink the edges of the leaf with Pinetree. Attach the pieces to the back of the pear. Use the Metal Adapter Plate with the other plates required for thin metal dies and cut Scrip Thanks from the red and brown Yuletide print. Cut, score and fold a 5" square card of Thistle Gingham. Asemble the card - attach "thanks" at a slight angle. 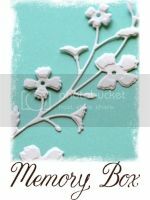 The Retro Border Die was used here to diecut the red accents - you can also use pieces from the Crystalline or Ornament Border Dies. Thanks for stopping by - and yes, there will be a "3rd Fastest, Easiest Card" too - using a different die. Have fun finding new ways to use the coversheets from all of your Memory Box 6x6 sets! Creepy (big) and Dangling (smaller) Spiders hang from the Small Creepy Web Frame here. They're highlighted against the Nightfall 6x6" print cut with the Debutante Die. Dave's also designed a larger Creepy Web Frame 98408 and a Small Debutante Frame 98430 so you can mix and match the different sizes. Diecut a bunch of extra spiders and tape them to your windows - and doorbell - to surprise the neighborhood trick or treaters too! Swooping Bars wing their way through Autumn Trees as they approach the Poppystamps Mini Picket Border. It's the perfect - and perfectly easy - way to surprise someone this Halloween. Thanks for stopping by - I'll have another fall project to share tomorrow. The Great Pumpkin Die 98423, Perky Pumpkin Face Die 98421 and Great Pumpkin G1882 team up on a quick card here. Add a touch of green with the delicate Whimsical Flourish 98373 and three Tiny Tendrils 98419. The Vintage Halloween Words G1802 background is stamped with the Spooktacular ColorBox inkpad then quickly clear-embossed. That's it...done! Everyone anticipates receiving Christmas cards - so surprise them with a Halloween card instead. Simple cards like this one are as much fun to make as they are to receive! Visit our website here - you'll love the great fall and Halloween stamps and dies. Here's another fun Halloween card - featuring the Poppystamps Grand Madison Window.